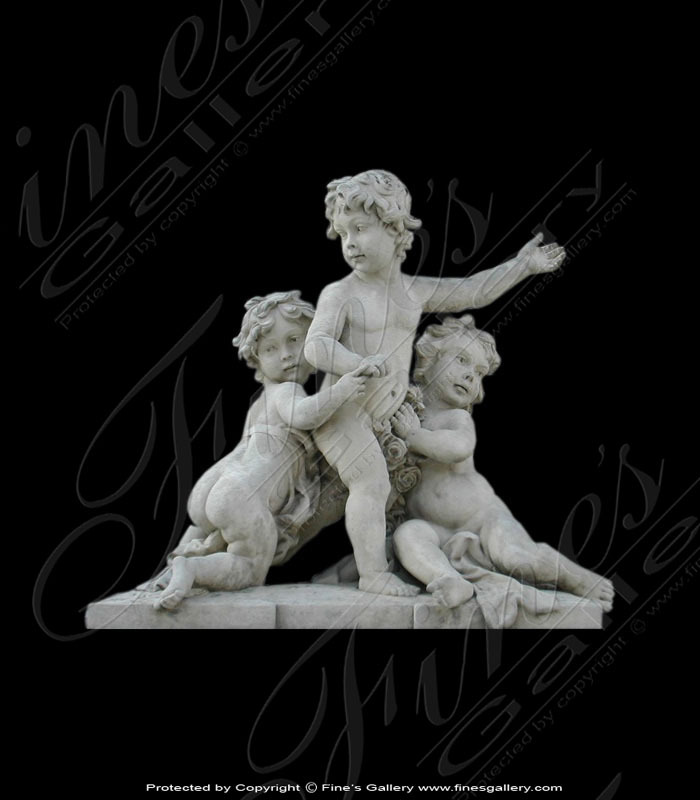 A wonderful antique calcium marble statue illustrating the playful youth of a boy and girl angel. Guaranteed to add cherished beauty to your outside decor with its antique charm. Expert skill is used to create this marble delight. 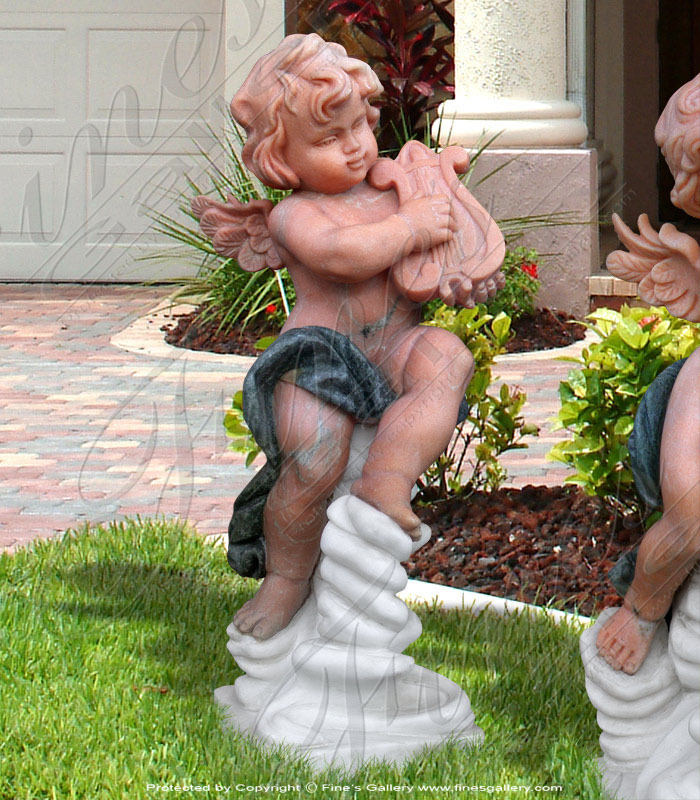 This beautiful pair of cherub statues has been hand carved from solid white marble. Very high relief and masterful carving provides the on looker with a sense of realism. Price is for a pair. 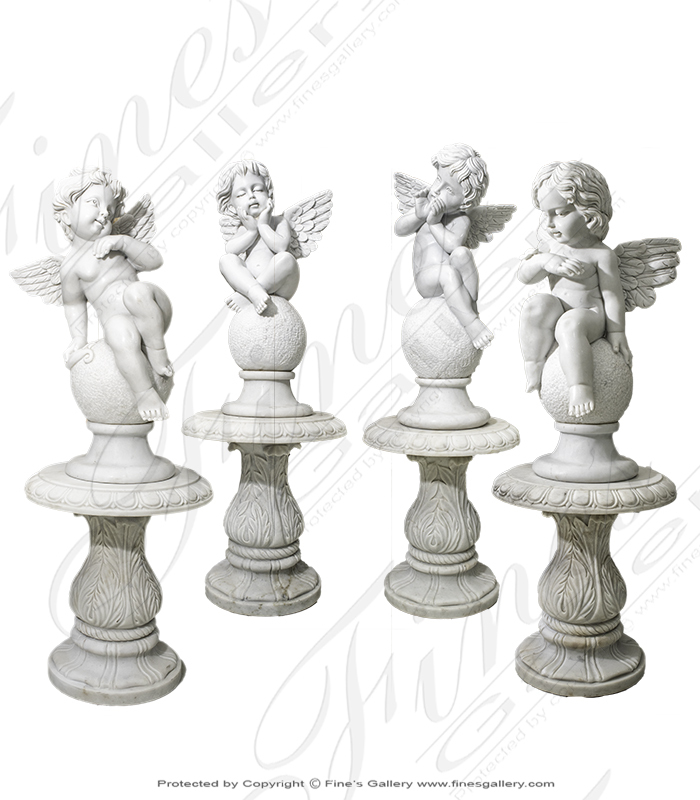 A set of four winged cherub statues carved from high quality light white marble. 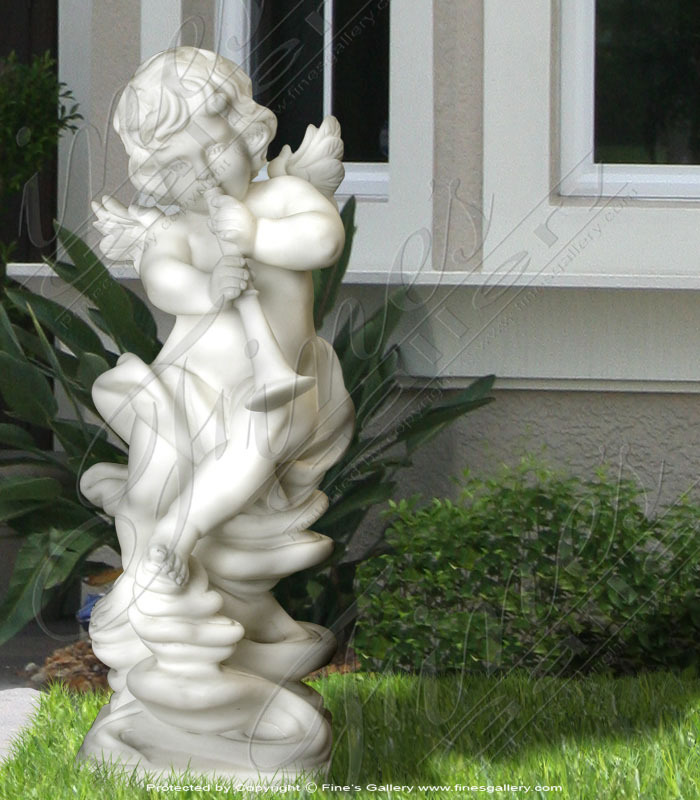 Beautifully hand carved pure white marble cherub statue. These two small children are helping their parents gather grapes to make wine. With help and support from each other, they get the job done faster than usual. 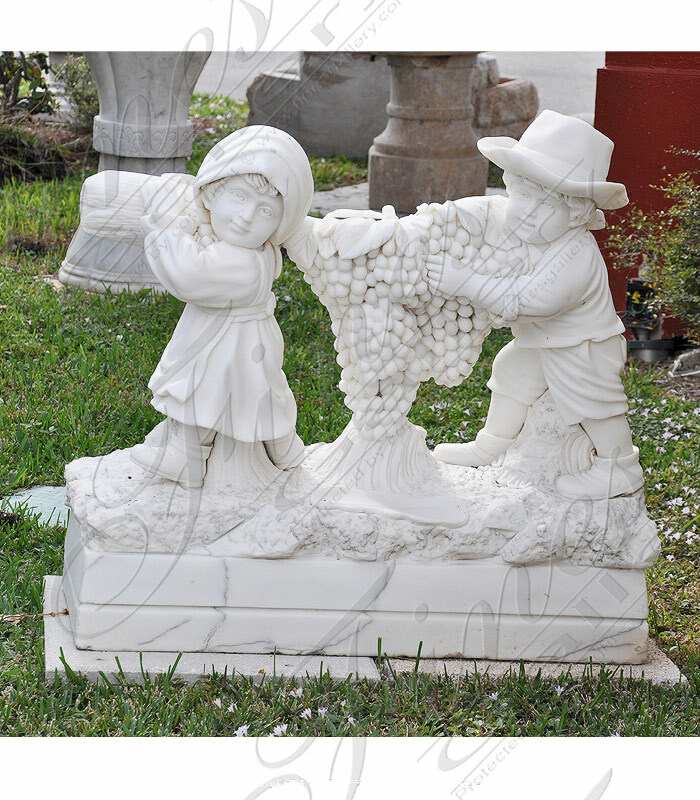 This cute marble stastue is hand carved from a striking white marble. 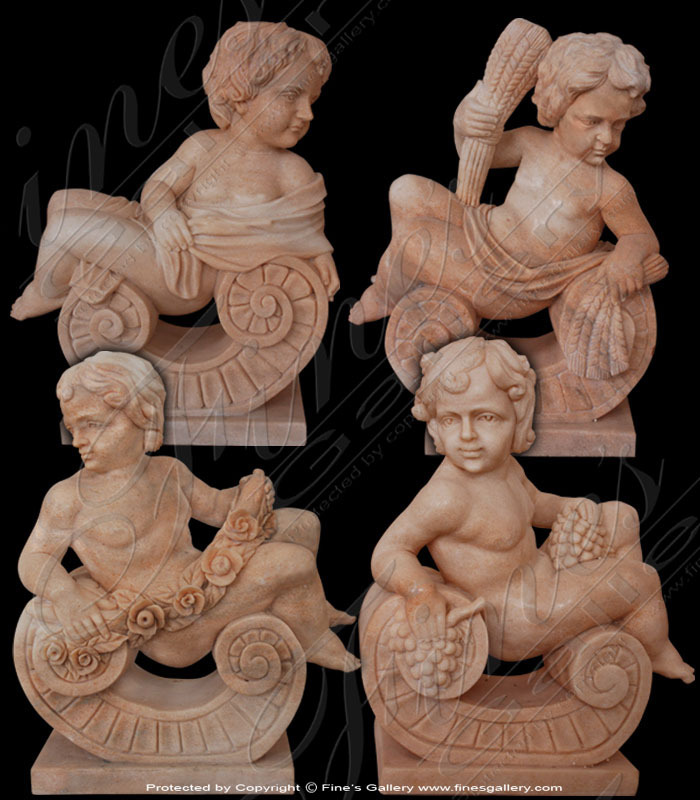 Four adorable cherubs are available here in this collection of fine Rosetta marble statues. Each childlounges uponaprettyseatand displaysarose garland, wheat stalks,grapes, orsimple luxury.Call us today. This beautifully detailed statue depicts a cupid playing the lute. He sits on a unique looking base while playing his song. 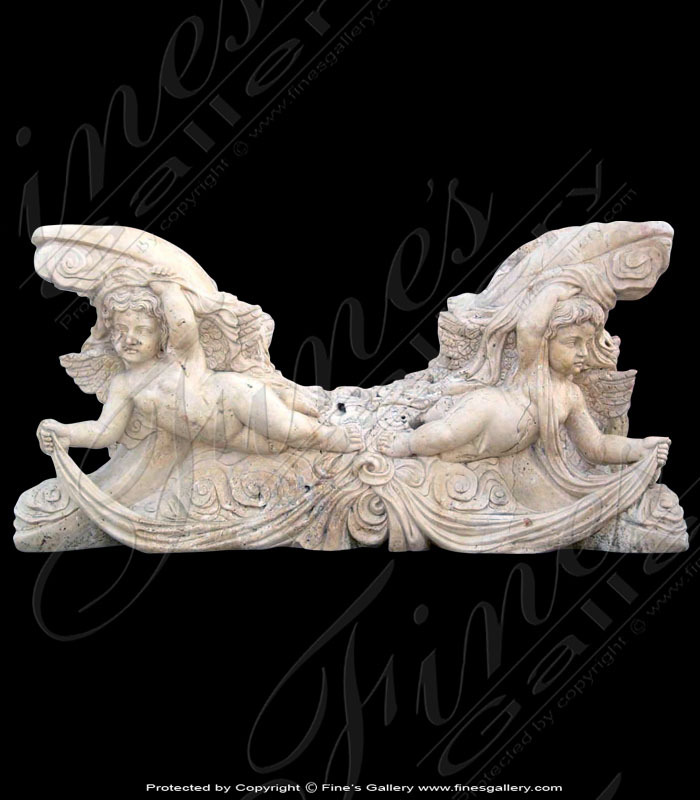 The sculpture was hand carved from a gorgeous white marble to enhance the contours and soft lines of the piece. 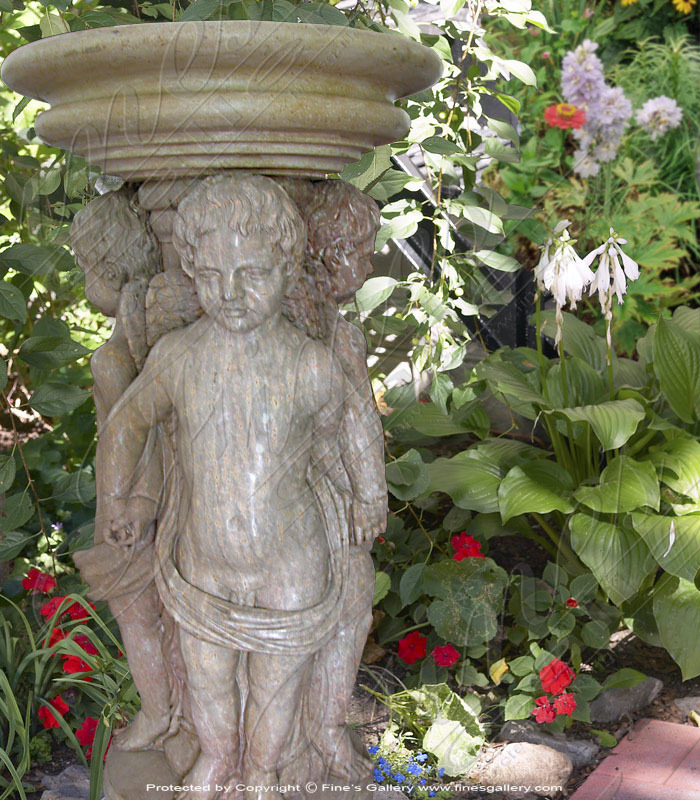 This statue shows acherubicboy holding a vaseand restingupon a beautifully ornate base. The sculpture is hand carved in a magnificent white marble to enhance the contours and give the piece definition.Contact the gallery today. 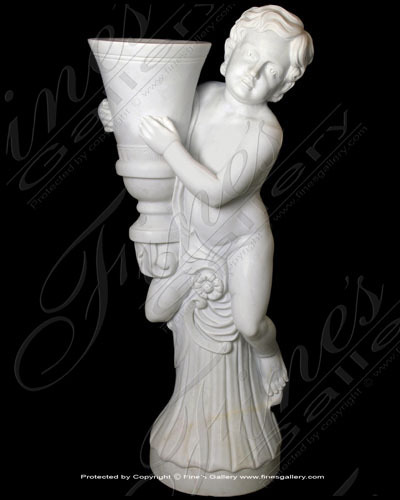 This marvelously detailed statue depicts a cupid playing the horn. He sits on a unique looking base while playing his song. The sculpture was hand carved from a dazzling white marble to enhance the contours and soft lines of the piece. 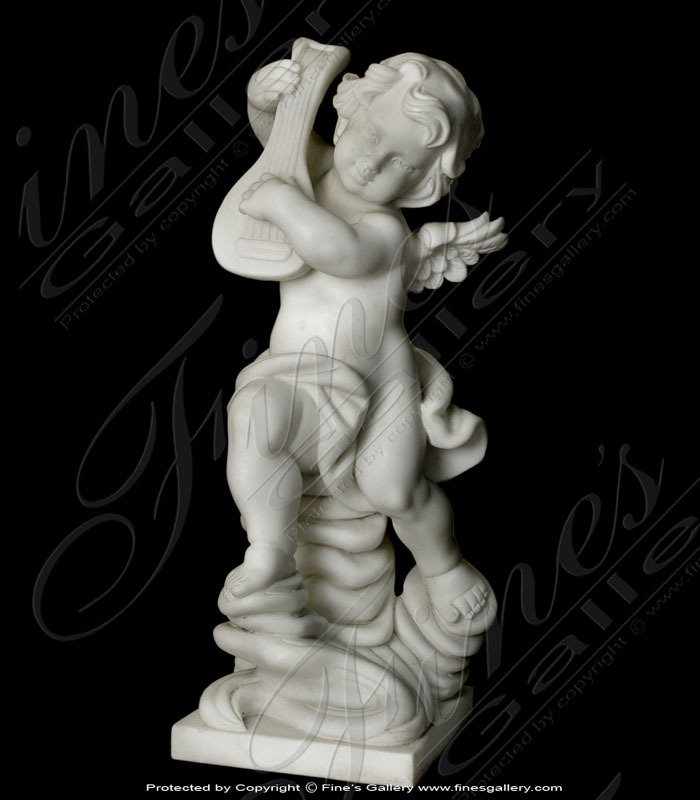 This adorable piece depicts a small cupid playing the flute. The base of the sculpture is hand carved from white marble, the cloth from green marble, and the body from light red marble. You'll love this piece. A lovely piece! 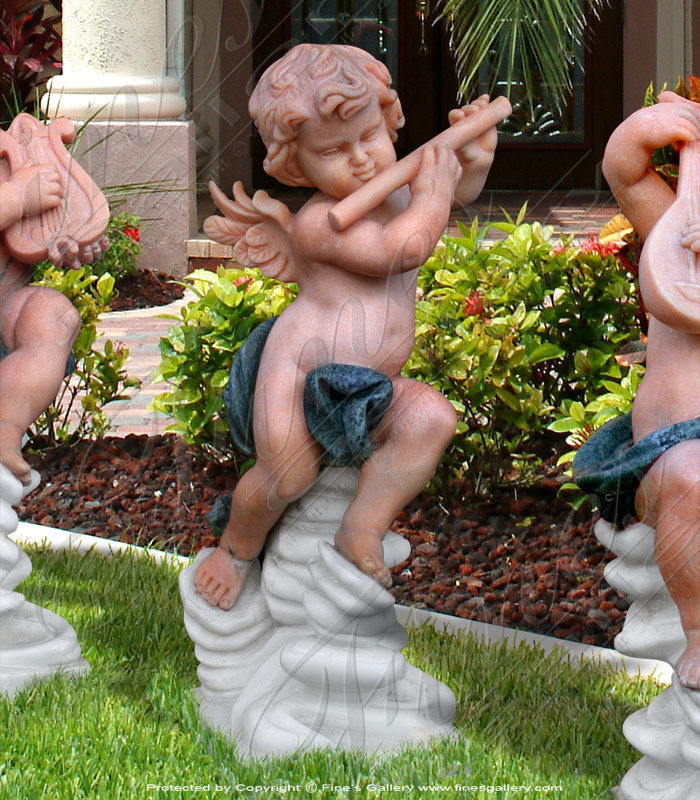 This skillfully hand carved statue portrays an adorable angel playing the harp. The base of the sculpture is hand carved from white marble, the cloth from green marble, and the body from beautiful reddish marble. 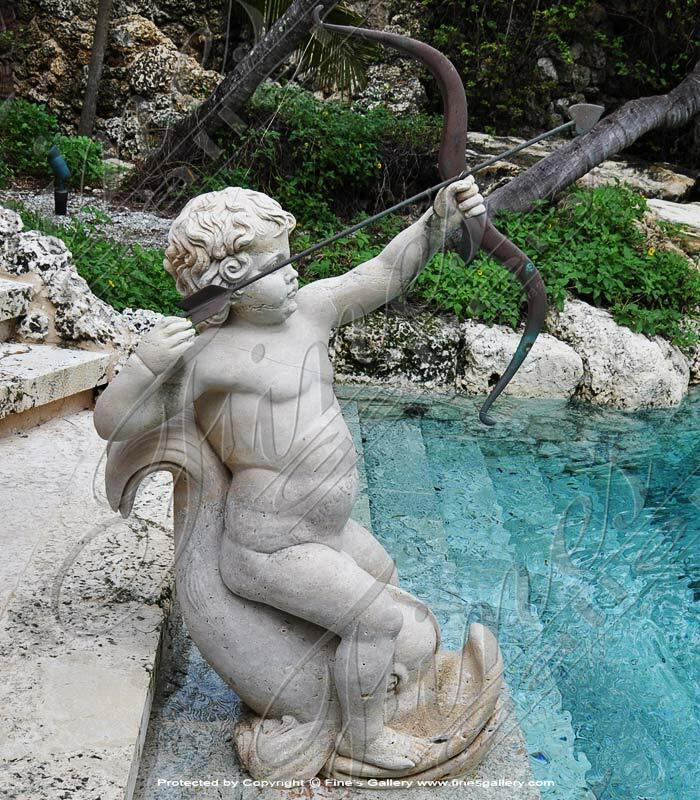 This endearing sculpture depicts a lovely cupid playing the lute. The base of the sculpture is hand carved from white marble, the cloth from green marble, and the body from light red marble. A fine home accent. Three beautiful, identical children are seen playing here in three graceful poses. Our team of experts has created these playful siblings with exceptional skill and stunning expression. Contact the gallery today to customize this piece. 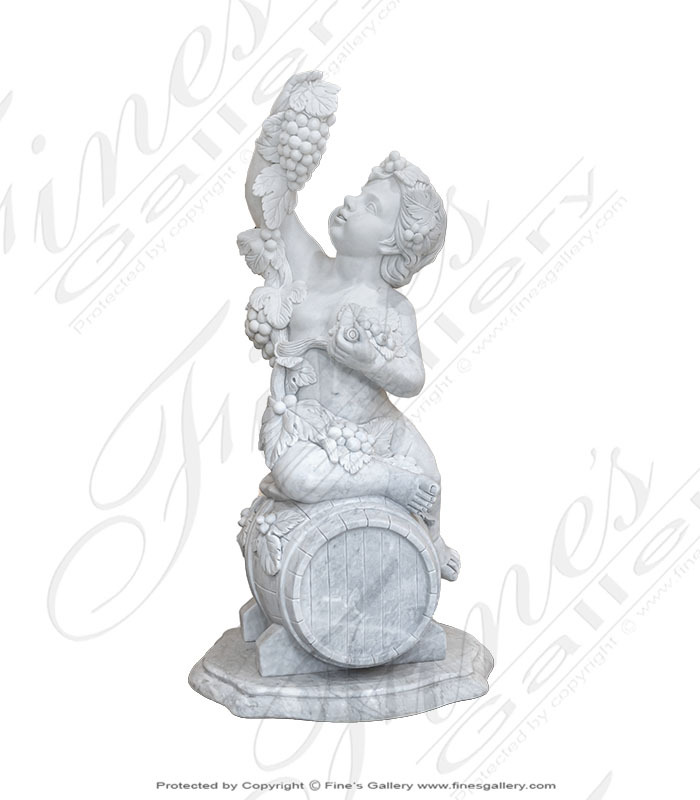 Admire the gorgeous detail on this lovely statue of a little child balancing on a vase and holding a bunch of grapes. 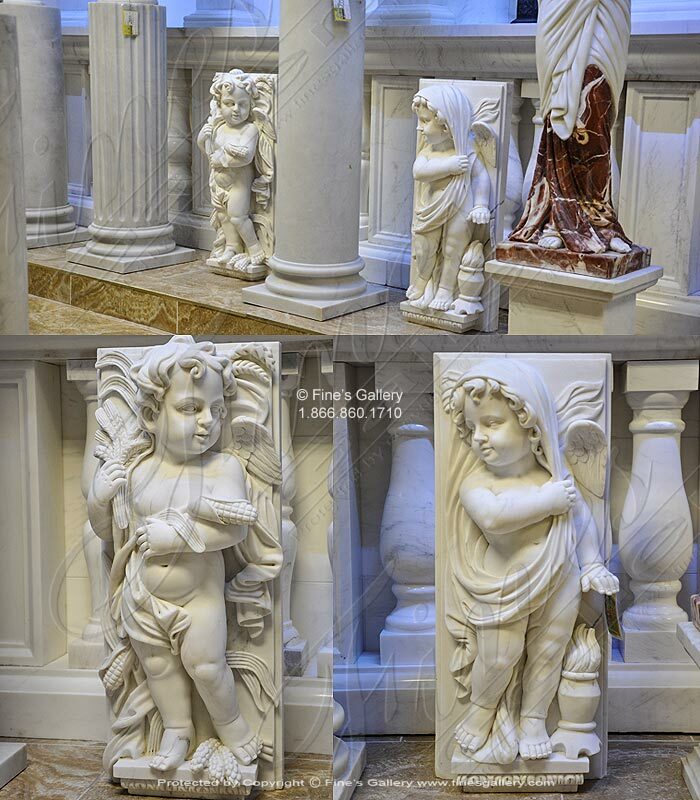 All carved by hand from our pure marble, available in any style or color we carry. 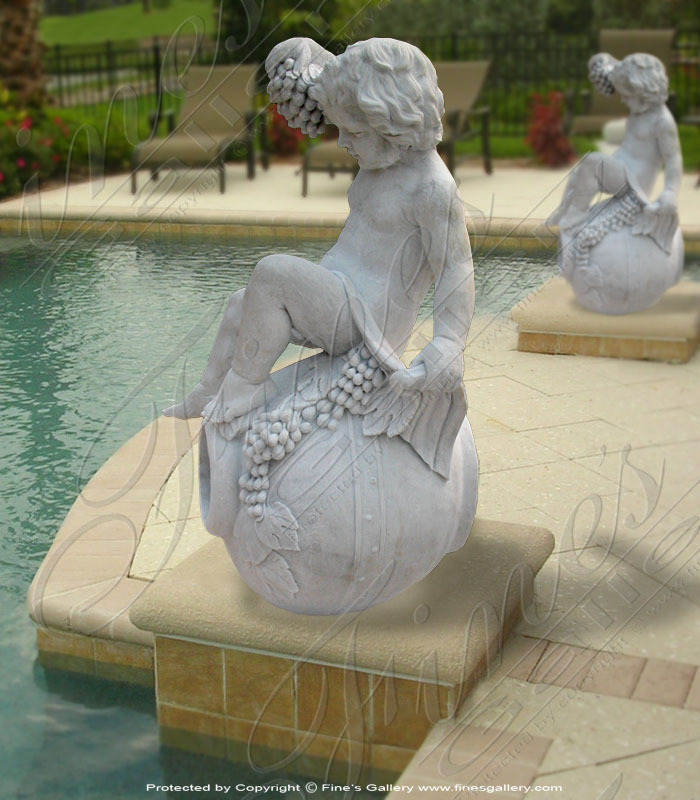 This makes a great poolside or garden enhancement. 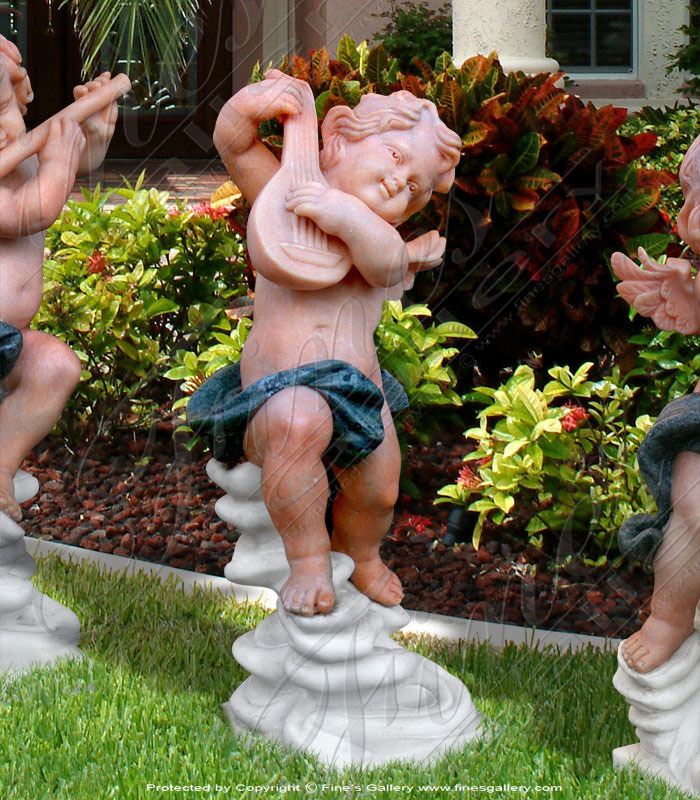 This lovely artwork shows three marble cupids against a pedestal that will look magnificent in the garden. Flawless craftsmanship used to create the figurines, all carved by hand. Call us today with the size you need to get a quote.